Rooflight Thermal Performance – it’s more than just the U value of the glass. The measure of a Rooflights heat loss is usually expressed in terms of U-value, which is the rate of heat loss in Watts per square metre per degree Kelvin temperature difference between the inside and outside of the rooflight. This is expressed as W/m²K, with a lower value defining a better insulating product. It should be noted that one degree Kelvin is equivalent to one degree Celsius. For example, if a rooflight had a U value of 1.0W/m2K then 1m2 of rooflight will let 1 Watt pass through it when there is a temperature difference of 1 degree between the inside face of the rooflight and its external face. 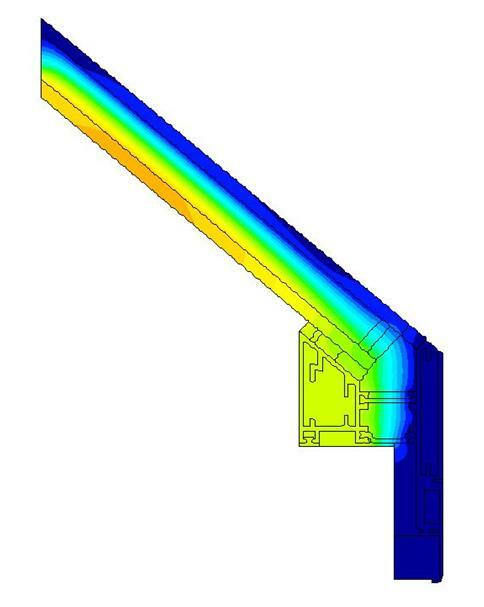 Therefore, to establish a rooflights U value, we must first calculate the heat loss through the rooflight and divide this value by the area of the rooflight. The resultant U value of the rooflight can then be compared to the limit values set by the applicable Building Regulation. The heat loss calculation required to satisfy the Building Regulations is one which establishes the heat loss in W/m2K through the whole of a rooflight, that being the rooflights framework and its glass. It is simply not enough to state the centre pane U value of the glass unit as this does not represent the U value of the entire rooflight product. Equally, thermal comparisons between competing rooflight products can only be made when U values for the whole rooflight are considered. A poorly designed triple glazed rooflight product may in fact perform worse than a well-designed double glazed product albeit the centre pane U value of the triple glazed glass unit may be better than that of the double glazed glass unit. 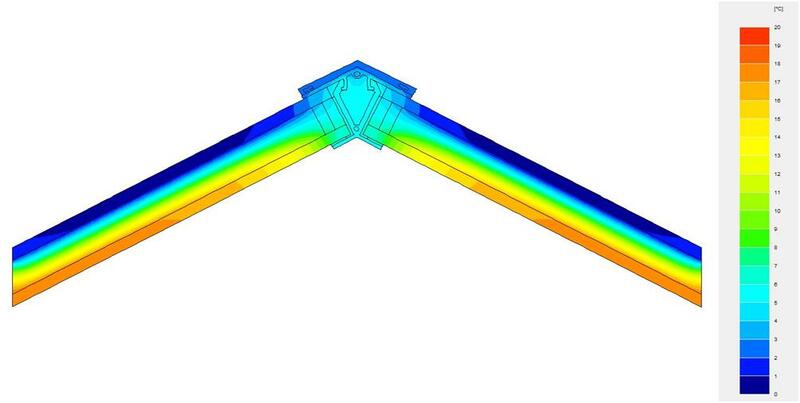 For more than a decade Duplus Architectural Systems have utilised two dimensional Finite Element Mesh Analysis Software. This has enabled us to optimise our products thermal design and create a range of rooflights that offer impressive overall U-values which meet or surpass the requirements of the Building Regulations. Every effort has been made to minimise the risk of condensation forming on our product under normal conditions. Condensation forms when warm moist air comes into contact with a cold surface, the air cools and can’t retain the same amount of water vapour. This excess water vapour is released and forms condensation. Although the risk of condensation is dependant upon how moist the air is and how cold the surfaces of the room are, a factory produced structural silicone glazed rooflight maintains significantly greater internal temperatures and has significantly higher resistance to condensation than an alternative framed solution. See diagrams below for further explanation. Our designs minimise the amount of aluminium exposed to heat loss externally. Aluminium has its advantages such as durability, strength and ease of manufacture, but thermally, aluminium is exceptionally good at conducting heat, which is a significant disadvantage when you are trying to design a product which loses as little heat as possible! To give you a practical example, BS EN ISO 10077-2 gives the thermal conductivity value of aluminium as 160 W/mK as opposed to glass which is 1 W/m K or softwood which is 0.13 W/mK. You can therefore, appreciate that limiting the size of any aluminium rooflight component has the potential to produce a better thermal design. The introduction of a thermal break, effectively separating the internal and external faces of the rooflight with a material which is many hundreds of times less conductive than aluminium, dramatically improves the performance of the rooflight. The thermal credentials of our structural silicone glazed rooflight product range are impressive, our opening rooflight products for example, which feature a significantly greater amount of aluminium than our fixed lights, incorporate a 35mm wide thermally broken zone which is fully insulated in order to give outstanding thermal performance. Our structural silicone glazing techniques allow us to produce lantern and pyramid rooflights without internal aluminium supporting framework to the hips or ridges of our products. Not only does this produce a truly contemporary appearance, but structural silicone glazing offers greatly improved thermal efficiency when compared to similar products which rely on supporting aluminium framework. Calculating the U value of most building elements is relatively easy as the calculation is simply overall heat loss through that building element divided by the area of that building element. However, as all flat glass rooflights are considered as “out of plane” (thereby greater in dimension than the opening or aperture to which they cover) and come in various shapes and sizes, the roof opening area can be significantly different to that of the surface area of the rooflight. Although the total heat loss value for the rooflight is constant the calculation of U value (heat loss /m2 area) requires a value for the rooflights area. The footnotes of Part L Building Regulations refer to Technical Doc NTD2(2010)). The scope of NTD2(2010) is to define a method of calculating the developed area of out of plane rooflights. When heat loss is divided by developed area the resultant U value is known as a Ud value. However, when calculating the area of a rooflight, only those areas through which there is significant heat conduction are included. When thermal comparisons are made between competing products it is important that distinctions are drawn between True U value and Developed area Ud values particularly in respect to rooflight products such as roof lanterns or pyramid rooflights as it is clear from the example above that Developed Ud values have the potential to be significantly less than true U value albeit total heat loss through the rooflight will be the same. The true U value and developed Ud value of all Duplus structurally silicone glazed rooflight products are available upon request. Design limits for rooflights are based upon Developed area Ud values which are defined in Part L of the Building Regulations for England and Wales or in the Technical handbooks for Scotland. Please advise our sales team prior to ordering which of the above Regulations applies to your enquiry particularly if your enquiry relates to rooflights smaller than our standard stock sizes. Condensation is chiefly a winter problem and is caused when water vapour comes into contact with a cold surface and condenses to form dampness or water droplets. Air can contain varying amounts of water vapour; warm air can hold more water vapour than cold air. When warm air comes into contact with a colder surface, it cools down and can’t retain the same amount of water vapour. The excess water vapour is released and forms condensation. The extensive thermal modelling of our product range has delivered a range of well insulated rooflight products that offer significantly better Ud values than required by the Building Regulations but also designs that comparatively, have a high resistance to condensation under normal conditions. We have been asked on numerous occasions by our customers if we could produce a framed contemporary lantern or pyramid rooflight which could be delivered in kit form for ease of handling, then built up on site with the same great contemporary looks of our current product. Our design team have reviewed this request very carefully. They considered several slim, lightweight framework solutions, each strong enough to carry the weight of the glass but without any significant framework projecting internally so as not to spoil the products contemporary look. The overall design would then have to be capable of resisting anticipated UK wind and snow loads. They concluded, that this could only be achieved with metal framing and that this framing would only have sufficient strength if it extended from beneath the glass through to the external surface of the glass thereby cold bridging the cavity of the double glazed unit. 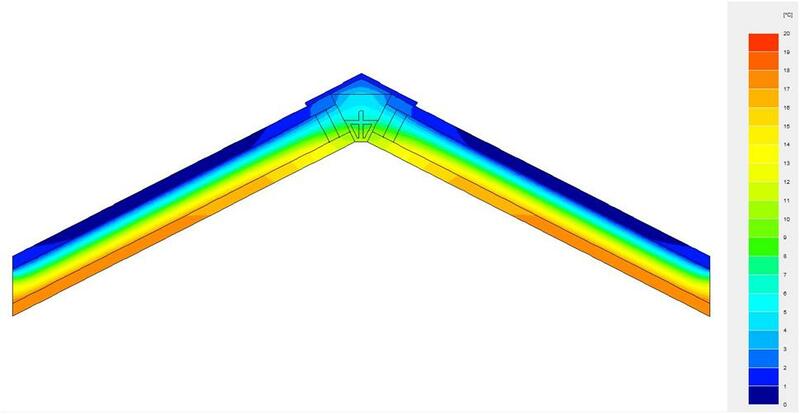 The first of the two thermal models below indicates why this solution was rejected by our design team and unfortunately the main reason why we do not offer a kit built lantern or pyramid rooflight. The model illustrates an aluminium framed rooflight solution at the junction between two pieces of glass, typically the hip or ridge detail. The internal room temperature is set at 20 degrees with the outside temperature set to zero. The model predicts an internal framework temperature for this design of less than 6 degrees under these conditions. This low temperature is fundamentally a result of the aluminium framework bridging the insulated zone/cavity of the double glazed unit and represents a significant condensation risk under these conditions. Framed rooflight (below) – Retains less heat, note the BLUE area beneath the ridge. Hence this design has significantly higher risk of condensation than the frameless solution shown at the bottom of the page. Our current lantern / pyramid rooflight design without internal framework. A factory produced structural silicone glazed solution which maintains significantly greater internal temperatures and hence has significantly higher resistance to condensation than the framed solution shown above.